Support from Obama's Barber, a Chicago Bear, and WLUW... Join Our Team! Wow what a month. Seems everyone is rallying for Tutoring/Mentoring. We still need YOUR support though... Please review what we have going on below and consider either a small contribution yourself... or pass the word to somebody who has the means to keep us mapping for justice into 2010 and beyond. Our goal is $50,000. Every bit helps. So, what has happened this month? 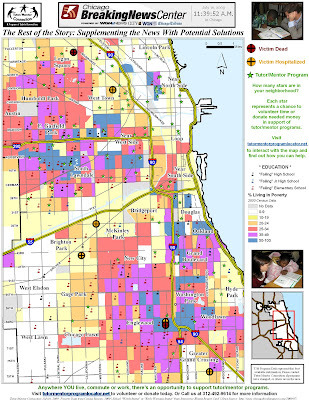 If you click on the map, it will expand to show the location of the barbershop, in relation to all known tutor/mentor programs, high-poverty neighborhoods (with struggling schools), and many of the area's businesses and community resources. The barber will use this to drum up conversation, and ultimately tutor/mentor support for local students. This is the sort of partnership we are looking for. We don't live in Hyde Park. We need local business leaders like the barbershop to communicate the advantages of tutoring/mentoring to parents, potential volunteers, and businesses in EVERY neighborhood. My maps help facilitate this process. We need your help to continue building these partnerships. Contact me to learn more. We also hosted a successful Golf Benefit, which was attended by several community leaders, and some NFL Players, including Bears linebacker Nick Roach, shown in this photo with Cabrini Connections eighth grader, Savon. Savon is an amazingly talented Cabrini Connections eighth grader who attends Tuesday night Tech Club (where I log my volunteer hour each week). At Tech Club, Savon works with me and professional graphic designer (And volunteer) Christine Kochevar. He is currently learning marketable Photoshop skills and will soon be making maps himself. Cabrini Connections Administrative Coordinator, EL Da' Sheon Nix (former Northwestern wide receiver himself) wrote a blog this week that features Savon's reflection on the event and what Cabrini Connection and Tutor/Mentor Connection (T/MC) means to Savon. One final exciting thing to report at the end of the month. The media finally took an interest in my story! Hopefully this is just the beginning! Mike Stephen at Outside the Loop RADIO on WLUW 88.7fm, podcast an interview that told my story as mapmaker, volunteer, and indie rock musician. Again, it's podcast, so please download it and listen to it if you haven't. In the interview, I make a call to action to all artists and musicians who have a dream to help your community, but are too afraid to make the commitment... or not sure how. I hope it inspires you to take action. And please forward this update to anyone with an interest in education, workforce development, the wars on crime/poverty... anyone can help us meet our goal of $50,000, one small donation at a time. Breaking News! 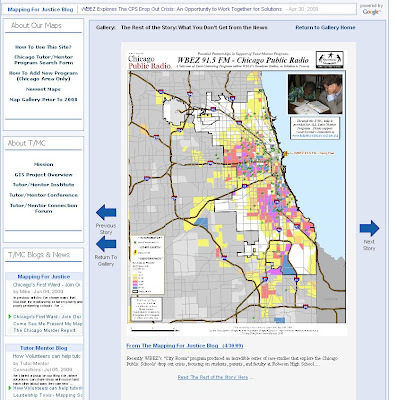 Maps to Help You Fight Crime and Poverty! I woke up today to "Breaking News" that proclaimed at least 8 people had been shot overnight in Chicago. As usual, I read names of kids who died, and recognized addresses from some of the same high-crime neighborhoods I've mapped before. I came into the office and mapped the locations, as I always do, to try and get a picture of where non-school tutoring/mentoring programs are offering guidance to youth, in proximity to the violence last night and low-performing schools. Please click on the map to see a larger, higher-resolution, and more detailed view. When you look at the map I made, try to locate the green stars. These are non-school tutoring/mentoring facilities. If you go to our interactive, online mapping tool, you can click on the stars and get contact information that will tell you details and contact information about each program. If you use our map tools - either my Map Gallery or the Interactive Asset Map - try to do some quick and dirty math. 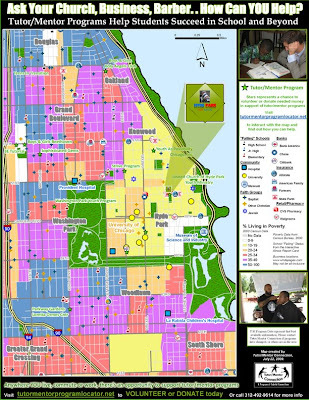 Try to think about how many kids are packed into a typical struggling Chicago Public School. Assume that each of the green stars/programs has a limited capacity - limited by a lack of funding and a need for volunteers... and well, x > y in most cases where there is high-poverty and inevitable crime. Then ask yourself if you think it's a good idea to mentor youth who are living with challenges that come from low school performance, poverty, and survival... challenges that, without guidance can turn to anger and violence. Like it did last night. You can exponentially raise awareness of the problem and educate/mobilize an army of those with the time to volunteer an hour or so a week. * But not everyone will have an hour to consistently spare... perhaps instead they have personal means or a charitable connection that would welcome the tax write-off that comes from donating to a non-profit... thus ensuring that those with the time to volunteer have places to do it. * And hey - don't let me stop YOU from getting involved yourself! I think both you and your network should join me here at this blog to consistently discuss The Rest Of The Story... and other tidbits related to maps... and education, community, social justice, and problem solvers like Tutor/Mentor Connection. Please bookmark my blog and come back for new maps and discussions. * I also know YOU would love the experience of volunteering with a kid you'd otherwise never have the chance to meet... and very possibly could change your life as much as you change his/hers. Please contact us to volunteer... or donate at http://www.tutormentorexchange.net/donate. Our growing mapping capacity (as evidenced today by my ability to turn out a map within hours of a request - for discussion of the news in this case... but just as easily for those whose strategies/partnerships need a map of locate assets, resources, or programs) is not-for-profit, and supported by benefactors and donations. If you know someone with a charitable interest in causes that combine social justice, kids, education, workforce development, and the war on poverty... we need their help to continue our efforts into 2010 and beyond. Please pass the message to any potential benefactors who can help us reach our $50,000 goal. Have them contact me or http://www.tutormentorexchange.net/donate for details. And again, please lean on your network... Here's an article of interest: 10 Ways to Support Charity Through Social Media. Unfortunately most people rely on "the news" for community information. And unfortunately if you're relying on Breaking News, all your getting is half the story - the problem... day after day... negative news. Social networking allows you to fill in the Rest of the Story... that you and your network have the ability to help solve those problems. Apologies for not posting in a couple weeks, but rest assured I've had my sleeves rolled up, creating an all-inclusive Map Gallery... a one-stop shop for all the maps I've produced, with links to each map's associated Mapping For Justice blog story. Notice that the left side features links to everything we do with maps: How-to documents and interactive animations, the interactive Google maps, the Tutor/Mentor Institute's strategy documents, the Program Locator. There is also a link to the awesome maps other volunteers made prior to my arrival at Tutor/Mentor Connection in 2008. Each of the 7 map categories in the Map Gallery have text that explains that category's significance in the overall mission of T/MC and its strategic use of maps to support tutoring/mentoring programs. If you read from top to bottom, you'll get a clearer sense of why maps are so important in our mission. At the bottom of each expanded map, there is a blurb from that map's associated blog (posted on Mapping For Justice)... with links to the blog if you want to read the full story. No organized and successful journey starts without a good map! 1. Thank you for your support over the past year and a half while our mapping resources were being developed. These maps, the interactive project, and this gallery wouldn't exist without a generous $50,000 act of charity from an unknown benefactor. We really need to find a new source of income to continue this not-for-profit map work... for the improvement of our workforce and economy, and for the welfare of our children and communities. If you know any potential benefactors, with an interest in community and workforce development... education... social justice... or simply "maps," please forward this to anyone with the capacity to help us continue our work. 2. I will be continuing to add new maps weekly, so remember to bookmark http://www.tutormentorprogramlocator.net/mapgallery.html and come back each week! 3. And last thing - realizing there are still probably a few issues here and there with the Map Gallery, since I just launched it... I invite you to take a look around and give me feedback as I tweak and improve the design... is it user-friendly? Are there things you'd like to see added or modified? What else do you like or not like? Thank as always for returning to this site, and for your continued support for tutoring/mentor programs!